The Police Department is now located in the Public Safety Building, located at 24 Intervale Drive, which is just off of NH Route 104, across from Main Street. The non-emergency number is (603) 744-5423. If no one is available to take your call, Belknap County Dispatch will intercept the call and take a message. The Administrative Assistant will be available Monday through Friday. Department personnel are in the office as time allows. Click here to read the Utilization of Roadway - Traffic Control Officers. This ordinance is related to the use of a roadway during construction, repair or maintenance of items adjacent to the roadway where such repairs or construction interfere or impede traffic. This ordinance will require a contractor, public or private utility company or private person to submit a Traffic Control Plan (TCP) to the Police Department for his review to determine if traffic control personnel are required to facilitate the safe passage of motorists, cyclists or pedestrians. For the convenience of our residents and our businesses, several of the commonly-used forms are available here in PDF format. We ask that they be printed and dropped off or mailed to the Police Department to safeguard the security of the private / sensitive information. 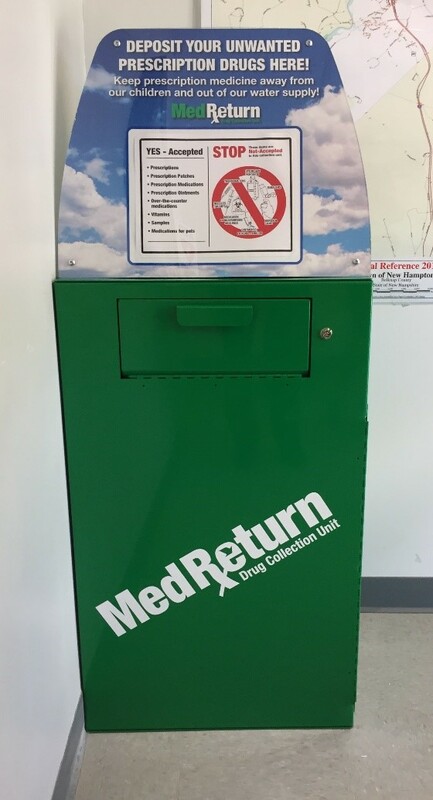 If you have unused or expired medications, you now have a way to safely and regularly dispose of them! The New Hampton Police Department is happy to announce the opening of a new permanent medication collection box in the town of New Hampton. The collection box is located in the lobby of the New Hampton Police Department at 24 Intervale Drive. Did you know?? Approximately 70% of those who abuse prescription medications get them from family or friends, often from the medicine cabinet. (SAMHSA, 2006) This permanent medication collection box addresses a vital public safety and public health issue. By taking unused and expired medications out of our community, it significantly reduces the opportunities for misuse and/or abuse. Protect our Groundwater! Flushing medications is NO LONGER recommended! Research shows that certain medications are not thoroughly flushed out during water treatment, and can end up contaminating our groundwater. Collection box is accessible Monday through Friday, 8:00 am to 4:00 pm. ONLY pharmaceutical drugs are to be placed in the box (prescription or over-the-counter medications). NO needles, syringes, lotions, aerosol cans, inhalers, or lancets will be collected. This voluntary collection process is FREE and ANONYMOUS. Any questions regarding the collection box can be directed to any Law Enforcement Officer at the New Hampton Police Department at 603-744-5423. For more information on safe and secure storage of medications, and for tips on how to talk to your family about prescription drug abuse, please contact Traci Fowler at Partners in Prevention, an initiative of the Lakes Region Partnership for Public Health: www.pipnh.org * 603-528-2145 x1800. Chief Stevens commenced his duties as Chief on September 10, 2018. After serving 20 years in the US Marine Corps, Chief Stevens entered law enforcement where he has served as both a State Trooper and a municipal Police Officer for the past 15 years, most recently as Chief of Police in the town of Hill, NH. Sgt Cunningham started her law enforcement career in 2002 with the Rockingham County Sheriff’s Dept. as a Dispatcher. While there she was promoted to Dispatch Supervisor, and subsequently became a Deputy Sheriff after graduating from the Police Academy in November 2003. In 2006, she left the Sheriff’s Dept. to join the Plymouth State University Police Dept. Sgt. Cunningham remained there until she was hired in New Hampton in 2007. Her duties now include administrative duties, assisting the Chief, approval of incident and arrest reports, training officers with writing complaints, affidavits, and search/arrest warrants. Sgt. Cunningham also serves as Field Training Officer, liaison/backup Prosecutor, and Evidence Officer. She holds an Associate Degree in Behavioral Science from Granite State College and is a Justice of the Peace. Sgt. Cunningham and her husband live locally, enjoy traveling and all outdoor activities. Detective Tyrrell was hired in April 2015. He graduated from the 167th NH Police Academy in August 2015. He has lived in the area since he was a teenager. Officer Tyrrell had been an auto mechanic and moved to New Hampton in 2011. In his off time, he enjoys hunting, farming, and spending time with his family. Detective Tyrrell duties include patrol as well as criminal investigations and presenting cases to the Superior Court Grand Jury. Detective Tyrrell is the department Firearms Instructor and the Evidence Officer. He is also responsible for maintaining weapons and equipment. Officer Marsh was originally hired in July of 2015 and graduated from the 270th part-time Police Academy. He has now graduated from the 176th full-time Police Academy. He grew up locally and enjoys spending time with his family and friends. He has been involved with emergency services as a paramedic and firefighter for the past 28 years, and is also a member of the New Hampton Fire Department. Officer Marsh is the department Portable Breathalyzer Tester (PBT) and is also on OC Spray Instructor. He is very active in making motor vehicle stops and maintains a high number of arrests. Officer Marsh shows tenacity in his drive for criminal investigations as well as his normal patrol officer duties. Officer Michalski began in March of 2017 and has had a long-time goal of becoming a police officer. He graduated from the 173rd Police Academy on August 18, 2017. Officer Michalski grew up in Sandwich and Meredith. He currently lives in Gilmanton with his girlfriend, their Pitbull, Gianni and their cat, Marley. He has been involved with emergency services for the past 5 years as an Advanced EMT. When not working, he enjoys outdoor activities including kayaking and boating and is a huge sports fan. Officer Killam joined our department in May of 2017 after working for a neighboring agency. He graduated from the 172nd Police Academy in April 2017. Officer Killam previously worked in an acute psychiatric facility, primarily working with juveniles. Officer Killam also served in the Army National Guard for six years and served one tour in Kuwait/Iraq where he took the lead gunner position for convoy security missions. He acquired the rank of Sergeant before his honorable discharge in 2015. Officer Killam enjoys target shooting, being outdoors, and driving just about anything with a motor. Officer Tyler Hazel was hired in May of 2017. He graduated from the 274th part-time Police Academy. Officer Hazel is also a full-time Correctional Officer for the Merrimack County Department of Corrections. He is currently enlisted in the United States Airforce Reserve. In his free time, Officer Hazel enjoys going to the gym, hiking, and hunting with his dog Gemma. Prosecutor Estee is a New Hampshire native and grew up in the greater Concord area. He holds a Bachelor of Arts in in Criminal Justice from Plymouth State University in 2007 and a Juris Doctor from the University of New Hampshire School of Law in 2012. Prosecutor Estee has worked as a prosecutor since passing the New Hampshire Bar Examination in 2012. Prosecutor Estee previously worked as a Special Assistant County Attorney for the Merrimack County Attorney's Office and currently prosecutes for the Town of New Hampton, the Town of Alton, and the Town of Barnstead. Samantha joined the Police Department in February of 2019 after working as a dispatcher for the Belknap County Sheriff’s Department. When not at work she spends as much as possible with her family and their pets. This notice is just to remind residents to never give out information of a personal nature such as date of birth, social security number or family member information to someone that has called you. Although these calls are difficult to trace as they usually originate out of state or even out of the country, please notify the police if you receive such phone calls. Click on the dates below to view the Police Department Activity. Month of Jan. Month of Feb.
Month of Sept. Month of Oct. Month of Nov. Month of Dec.
Month of May Month of June Month of July Month of Aug.
Month of Jan. Month of Feb. Month of Mar. Month of Apr. Month of Oct. Month of Nov. Month of Dec.
June 19 to June 25 Month of July Month of Aug. Month of Sept.